Anton Reicha (1770 – 1836) was a Bohemian-born, later naturalized French composer of music very much in the German style. A contemporary and lifelong friend of Beethoven, he is now best remembered for his substantial early contributions to the wind quintet literature and his role as teacher of pupils including Franz Liszt and Hector Berlioz. He was also an accomplished theorist, and wrote several treatises on various aspects of composition. Some of his theoretical work dealt with experimental methods of composition, which he applied in a variety of works such as fugues and études for piano and string quartet. Reicha was born in Prague. His town piper father died when the boy was just 10 months old, leaving him in custody of a mother who had no interest in educating him. The young composer ran away from home when only ten years old, and was subsequently raised and educated in music by his paternal uncle Josef Reicha. When they moved to Bonn, Josef secured for his nephew a place playing violin in the Hofkapelle electoral orchestra alongside the young Beethoven on viola, but for Reicha this was not enough. He studied composition secretly, against his uncle's wishes, and entered the University of Bonn in 1789. When Bonn was captured by the French in 1794 Reicha fled to Hamburg, where he made a living teaching harmony and composition and studied mathematics and philosophy. Between 1799 and 1801 he lived in Paris, trying to gain recognition as an opera composer, without success. In 1801 he moved on to Vienna, where he studied with Salieri and Albrechtsberger and produced his first important works. His life was once again affected by war in 1808, when he left Vienna when it was occupied by the French under Napoleon and returned to Paris, where he spent the rest of his life teaching composition and in 1818 was appointed professor at the Conservatoire. Reicha's output during his Vienna years included large semi-didactic cycles of works such as 36 Fugues for piano (in a "new method of fugal writing"), L'art de varier (a set of 57 variations on an original theme), and exercises for the treatise Practische Beispiele (Practical Examples). During the later Paris period, however, he focused his attention mostly on theory and produced a number of treatises on composition. 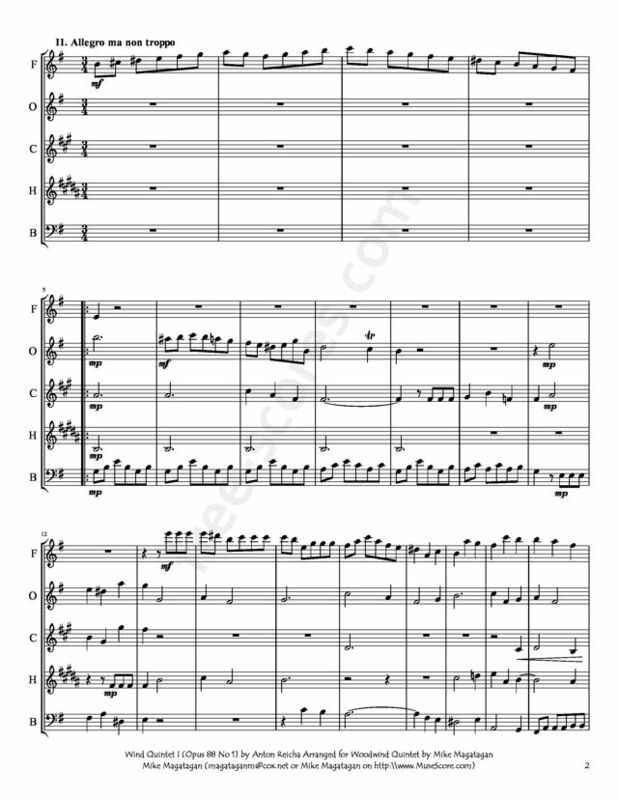 Works of this period include 25 crucially important wind quintets which are considered the locus classicus of that genre and are his best known compositions. None of the advanced ideas he advocated in the most radical his music and writings (not used in the 25 great wind quintets), including polyrhythm, polytonality and microtonal music, were accepted or employed by nineteenth-century composers. Due to Reicha's unwillingness to have his music published (like Michael Haydn before him), he fell into obscurity soon after his death and his life and work have yet to be intensively studied. 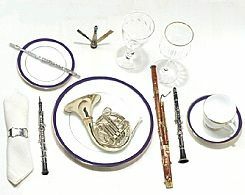 Musically, the wind quintets represent a more conservative trend in Reicha's oeuvre when compared to his earlier work, namely the compositions of the Viennese period. Instead, Reicha was inspired by the supreme artistry of his players from the Opéra Comique to explore the technical limits of the five instruments comprising the wind quintet, with writing that combines elements from comic opera, folk tradition, military marches and fanfares with his lifelong interests in variation form and counterpoint. Technical wizardry also prevails in compositions that illustrate Reicha's theoretical treatise Practische Beispiele (Practical Examples) of 1803, where techniques such as bitonality and polyrhythm are explored in extremely difficult sight-reading exercises. 36 fugues for piano, published in 1803, was conceived as an illustration of Reicha's neue Fugensystem, a new system for composing fugues. Reicha proposed that second entries of fugue subjects in major keys could occur in keys other than the standard dominant), to widen the possibilities for modulations and undermine the conservative tonal stability of the fugue. The fugues of the collection not only illustrate this point, but also employ a variety of extremely convoluted technical tricks such as polyrhythm (no. 30), combined (nos. 24, 28), asymmetrical (no. 20) and simply uncommon (no. 10 is in 12/4, no. 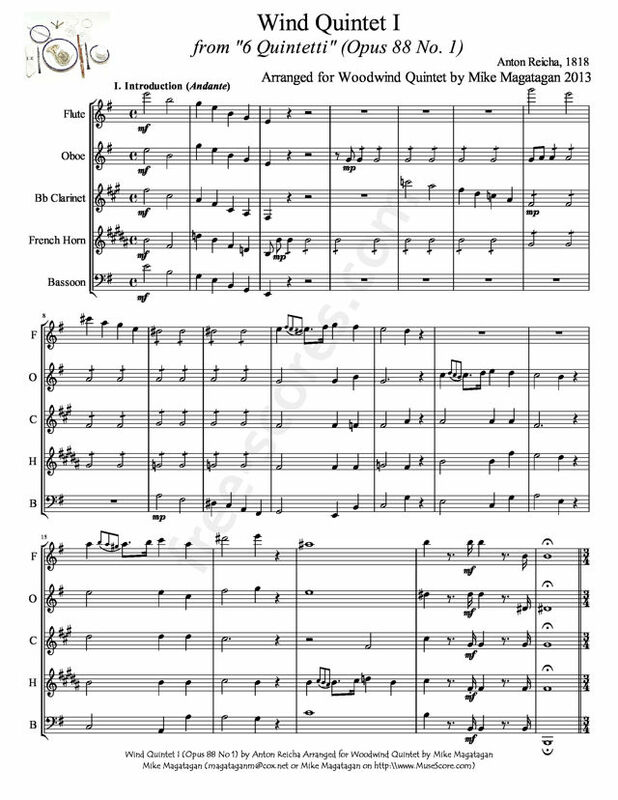 12 in 2/8) meters and time signatures, some of which are derived from folk music, an approach that directly anticipates that of later composers such as Béla Bartók. No. 13 is a modal fugue played on white keys only, in which cadences are possible on all but the 7th degree of the scale without further alteration. Six fugues employ two subjects, one has three, and No. 15 six. In several of the fugues, Reicha established a link with the old tradition by using subjects by Haydn (no. 3), Bach (no. 5), Mozart (no. 7), Scarlatti (no. 9), Frescobaldi (no. 14) and Handel (no. 15). Many of the technical accomplishments are unique to fugue literature. 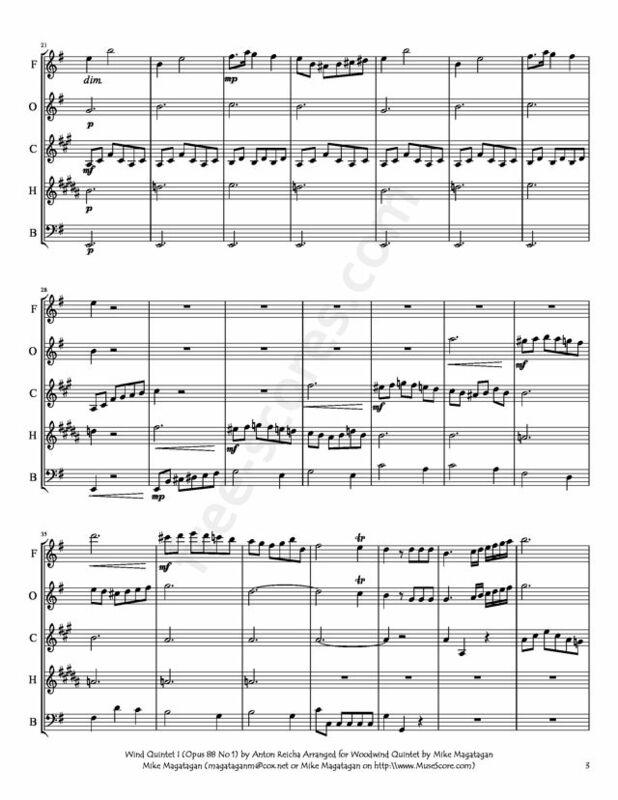 Although originally written for Flute, Oboe, Clarinet in C, Horn in E & Bassoon I created this arrangement forWoodwind Quintet (Flute, Oboe, Bb Clarinet, French Horn & Bassoon). 1 partitions trouvées pour "Wind Quintet for Woodwind Quintet"